Hope this post brings you much light and encouragement. The other day I had just finished talking to my father about my work and how it related to us culturally. Shortly afterward because my little niece was running around and she loves music, my father decided to put on The Wiz. Great movie, I don't care what anyone says, the late 70s and early 80s was the BOMB. For those who don't know the Wiz is the best retelling of the Wonderful Wizard of Oz, but it is done from an African American cultural perspective. As I continued to watch the movie another favorite scene came up, which was when the gang goes to Evillene's Sweat Shop, the Wicked Witch of the West (played by Mabel King), which was dark red. I didn't see the connection yet. 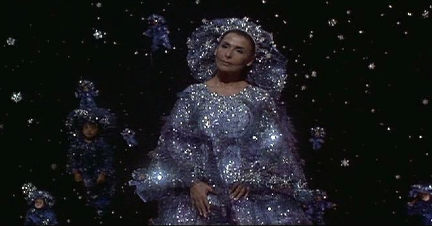 Until, after Dorothy kill's Evillene and tries to get back home, where she finds that the Wiz cannot help her. "Ummm....Does this look familiar?" I heard. Noticed the maa aankh below the red region symbolizes TASETT (the evil, physical, hard labor, desert, impotent, etc.) and black region symbolizes KAMTA (the good, spiritual, easy, prosperous, fertile, night sky, heavens, etc.). 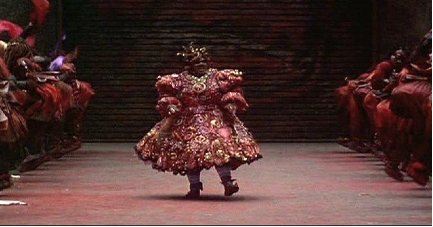 I am not sure if the creators of the Wiz were aware of this cultural significance or not. What I do know is that the Wiz makes a lot more sense psychologically than the Wonderful Wizard of Oz. What do you think?